When I first got to Washington in the mid-1980s, one of the big issues was the supposedly invincible Japanese economy. Folks on the left claimed that Japan was doing well because the government had considerable power to micro-manage the economy with industrial policy. With the benefit of hindsight, it’s now quite apparent that was the wrong approach. In more recent years, some on the left have praised China’s economic model. And while it’s true that the country has enjoyed strong growth, it’s far from a role model. Here’s some of what I wrote back in 2010. Yes, China has been growing in recent decades, but it’s almost impossible not to grow when you start at the bottom – which is where China was in the late 1970s thanks to decades of communist oppression and mismanagement. …This is not to sneer at the positive changes in China. Hundreds of millions of people have experienced big increases in living standards. Better to have $6,710 of per capita GDP than $3,710. But China still has a long way to go if the goal is a vibrant and rich free-market economy. The country’s nominal communist leadership has allowed economic liberalization, but China is still an economically repressed nation. With my skeptical view of the Chinese economic system, I figured it was just a matter of time before the nation experienced some economic hiccups. And the recent drop in the Shanghai stock market certainly would be an example. I discussed the topic earlier this week in this Skype interview with Blaze TV. To elaborate, there’s no precise formula for determining a nation’s prosperity. After all, economies are not machines. But there is a strong relationship between prosperity and the level of economic freedom. And as I explained earlier this year, China’s problem is that government is still far too big. As such, its overall ranking from Economic Freedom of the World is still very low. And this means that the Chinese people – while much better off then they were under a pure communist system – are still not rich. I mentioned the comparative numbers on per-capita economic output in the interview, which is something I wrote about back in 2011. And you can click here if you want the underlying figures to confirm that Americans are far more prosperous. By the way, this is an issue where the establishment seems to have a semi-decent understanding of what’s happening, even if they don’t necessarily draw any larger lessons from the episode. The Associated Press, for instance, has a good report on the issue. Here’s some of the story, which looks at why the the stock market seems untethered from economic fundamentals. When China’s economy was roaring along at double digit rates in the 2000s, Chinese stocks floundered. But starting in the summer of 2014, as evidence of an economic slowdown gathered, the Shanghai Composite index climbed nearly 150 percent. …Now the Chinese stock bubble has burst and Shanghai shares are in a free fall. They’ve lost about 30 percent since peaking last month. …Prices in the stock market are supposed to reflect business realities: the health of the economy, the quality of the companies listed on stock exchanges, the comparative allure of alternative investments. But in a communist country where the government plays an oversized role in the economy, investors pay more attention to signals coming from policymakers in Beijing than to earnings reports, management shake-ups and new product announcements. If savvy investors think it’s important to focus on what the government is doing, that’s obviously bad news. During the booming 2000s, only politically connected firms were allowed to list on stock exchanges for the most part. Many of them were run by insiders of dubious managerial talent. The markets were dominated by inefficient state-owned companies. Investors were especially wary of investing in big government banks believed to be sinking under the weight of bad loans. Stocks went nowhere. And when the government started to encourage a bubble, that also wasn’t a good idea. …state media began encouraging Chinese to buy stock, even as the country’s economic outlook dimmed. The economy grew 7.4 percent last year, the slowest pace since 1990. It’s expected to decelerate further this year. But authorities allowed investors to borrow to buy ever-more shares. Unsophisticated investors — more than a third left school at the junior high level — got the message and bought enthusiastically, taking Chinese stocks to dangerous heights. Now it’s all crashing down. I’m not sure “all crashing down” is the right conclusion. As I said in the interview, the market doubled and now it’s down about 30 percent, so many investors are still in good shape. That being said, I have no idea whether the market will recover, stabilize, or continue to drop. But I do feel comfortable making a larger point about the relationship between economic freedom and long-run prosperity. So if you want to learn lessons from East Asia, look at the strong performances of Hong Kong, Taiwan, Singapore, and South Korea, all of which provide very impressive examples of sustained growth enabled by small government and free markets. P.S. I was greatly amused when the head of China’s sovereign wealth fund mocked the Europeans for destructive welfare state policies. P.P.S. Click here if you want some morbid humor about China’s pseudo-communist regime. P.P.P.S. Though I give China credit for trimming at least one of the special privileges provided to government bureaucrats. The big difference is that in the US politicians and regulators are doing quite well, but they are controlled by big money. In China, the politicians and regulators are the big money. If US big money realizes that they could do better with smaller government, it will happen. 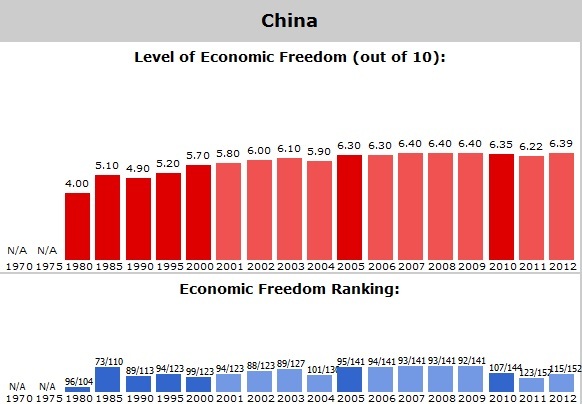 Some stuff about economic freedom rating in China, in the long run, it looks like a promising country for investment, because they have a long way to go. What do you think about stability in China Kevin. I the party very very strong. Will they last, are they becoming more free as time goes on? So the macroeconomic issue is whether China’s current per capita prosperity has reached a level commensurate with its current economic freedom and ranking. While obviously China cannot reach American levels of current prosperity under its still stifled freedom levels, perhaps the equilibrium level for its already acquired partial freedom is $20k per capita instead of the current 10k. If that is the case, China will continue to grow at multiples of American growth, and certainly even higher multiples of European growth, in the foreseeable future. And BTW a China that reaches the $20k per capita income level will be an economy bigger than the U.S. and Europe combined. The world will feel different then. China’s rise from $10k to $20k per capita income alone is enough to sink the “poor” American middle class voter-lemming’s ranking from the world’s top 5% down to the top 10%. The world will start feeling different to the American voter lemming. The question is what does the world as a whole do? If the world as a whole is growing at 4% and your country is growing by 2%, your ranking is dropping by2% annually, and compounding. You are living the years of decline. Hence the American voter lemming will continue his ideological convergence to the even faster declining continent of Europe. Most voter lemmings will choose one redistribution dollar today over five perpetually compounding growth dollars in the future. So most voter lemmings will recycle into average world prosperity, as middle income citizens of a future middle income country. China may yet go through another semi peaceful freedom revolution. In a way I give that more chances than I give the American voter lemming reversing course on his European trajectory.